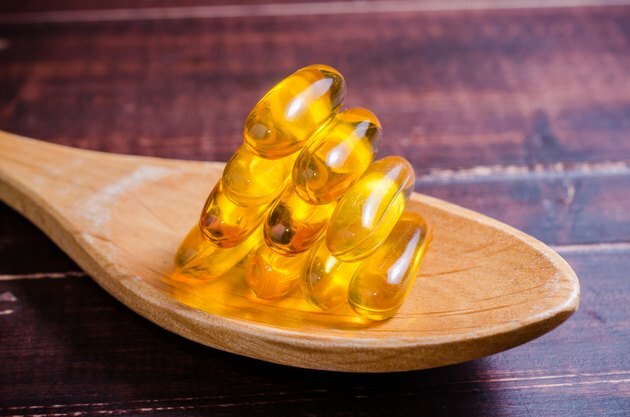 As study after study documents the mental, cognitive and physical benefits of omega-3 fatty acids, fish oil supplements, which are rich in omega-3 fatty acids, have steadily grown in use, surpassing even multivitamins in popularity, according to the February 2011 "Orlando Sentinel." If you are considering supplementing with fish oil, you have a variety of options available, including liquid fish oil or capsules. Capsules offer several advantages, but those who have difficulty swallowing capsules may still prefer the liquid form. Whether you plan to use liquid or capsules, always consult with your physician first because people on certain medications or those with seafood allergies or various medical conditions may not be able to take fish oil. Fish oil, whether in liquid or capsule form, has two essential omega-3 fatty acids -- DHA and EPA -- which may provide numerous benefits. The DHA and EPA in fish oil may lower the buildup of atherosclerotic plaques, cholesterol, blood pressure and triglycerides and reduce the risk of death due to stroke, abnormal heart rhythms and heart attack. DHA and EPA may improve the symptoms of rheumatoid arthritis, lupus, macular degeneration and menstrual pain, as well as symptoms of various psychiatric and developmental disorders, including bipolar disorder, schizophrenia, post-partum depression, attention deficit hyperactivity disorder, dyspraxia in children and developmental coordination disorder, according to the University of Maryland Medical Center and Medline Plus, a medical website sponsored by the National Institutes of Health. People who have difficulty swallowing large pills or capsules might prefer liquid fish oil, which goes down your throat more easily. As refinement and filtering procedures have improved, fish oil has become far more palatable, and many manufacturers market fish oil that is sweetened and flavored to improve palatability. You can apply the fish oil to a salad or mix it into juice or a smoothie to further mask the flavor. According to Baltimore Health Practice, you probably need to take multiple capsule supplements to get the same amount of omega-3s that you would get in a teaspoon of liquid fish oil. Once it has been opened, liquid fish oil is more vulnerable to going rancid. Exposure to light, heat and air expedites the oxidation of the oil, which transforms the healthy omega-3 fatty acids into a compound that not only lacks the healthful benefits of EPA and DHA, but it also might increase the risk of certain side effects, such as aftertaste, belching and gastrointestinal distress, according to HealthyOilPlanet.com. Once you open a bottle of liquid fish oil, store it in a dark place to help prevent it from going rancid. Many people find it easier to swallow odorless, flavorless fish oil capsules than to swallow strongly flavored liquid fish oil. Fish oil capsules contain the fish oil in airtight capsules, which reduces the risk of oxidation and enhance the shelf life of the oil. Dosaging is fairly straightforward with capsules; once you determine how many pills you need to take for your condition or purpose, you simply count out the pills. For those who experience gastrointestinal side effects of fish oil, such as heart burn, sour stomach, bloating or diarrhea, the gel capsules delay the release of the acidic fish oil, minimizing how long it spends in your stomach and reducing reflux. If you freeze the capsules before taking them, even more of the oil is released in your lower intestine rather than your stomach, which further reduces side effects. A very small minority of people have allergic reactions to the gel capsule, which is made from the same substance as gelatin. Many gel capsules are made from body parts of pigs and cows, making them non-kosher and off limits for certain groups. Orlando Sentinel: Are You Taking the Most Popular Supplement in the U.S.?